It could be argued that when we go out to dine or drink we ought to share the experience with the friends surrounding us, and perhaps even strangers in the vicinity. At least, that’s how it used to be. But more and more, faces stuck to phones, we share public outings through our digital devices, chatting with humans we may never meet in the flesh, and ignoring people within speaking distance. Julien Thomas, a Vancouver construction worker by day and social artist by night, has erected a digital-signal-repelling café in Vancouver’s Chinatown in an effort to draw people back to people, and the traditional café scene. 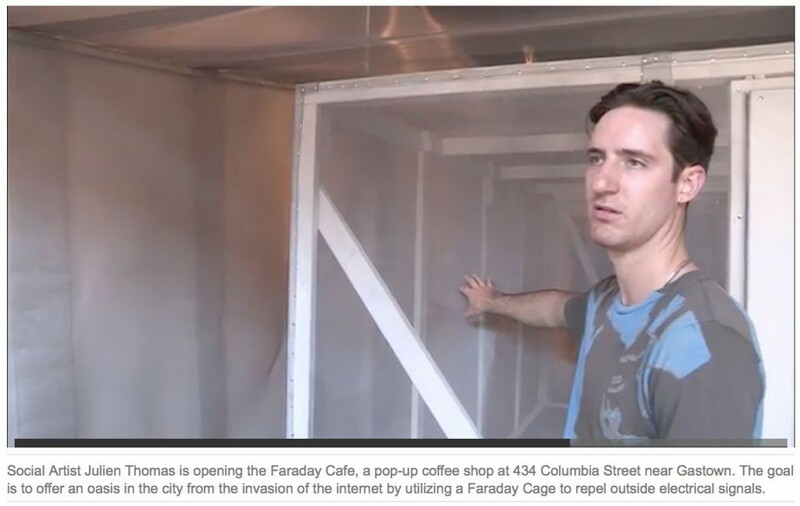 The Faraday Café — which will be open for just two weeks — is named after the Faraday cage, a device used in lab settings that blocks out electrical waves through the use of conductive material. Thomas feels — and says he senses many others do too — that something has been lost in the past few years. Wherever we are, we feel compelled to text or answer texts, tweet selfies, and constantly document our existence in the virtual world. Even if we aim to be alone and contemplate private thoughts, we’re just an incoming text away from distraction. Thomas was rushing to put the final touches on his café space, a white-walled room filled with aluminum window mesh. He and an architect partner had found that blocking out electromagnetic signals was harder to do than they had imagined. A flowing and multi-layered design of mesh walls and corridors provided the most visual appeal, but in testing several days ago they found that very small folds and gaps in the unboxy design allowed Internet signals to invade the room. So Thomas had to improvise, and constructed a “cage” in the centre of the café which will be truly digital signal free. Thomas said the purpose of his café experiment is not really to promote “anti-phone” culture, but to get people thinking about seeking pockets of freedom in a wired world. He feels that using special architectural materials to block out virtual reality is taking the explicit no-phone policies already enforced in some venues, such as theatres or galleries, to the next level. The Faraday Cafe, at 434 Columbia Street, will serve artisanal coffees by donation and feature special events and DJs, from July 3-16. This entry was posted on July 3, 2014, 12:16 pm and is filed under faraday cage, Vancouver. You can follow any responses to this entry through RSS 2.0. You can leave a response, or trackback from your own site.